This is the perfect choice all-round reel for the UK based angler? Available in two sizes and featuring the somewhat unique combination of a lever drag, level wind and centrifugal brakes, this is one reel that is equally at home casting baits uptide from an anchored boat as it is working artificial lures such as jelly worms and shads over deepwater wrecks and reefs on the drift. 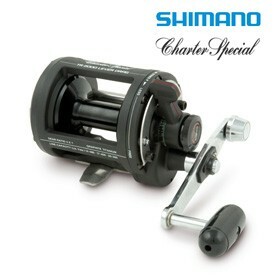 The Shimano Charter Special is ideal for use with either braid or monofilament lines. This is the perfect choice all-round reel for the UK based angler? Available in two sizes and featuring the somewhat unique combination of a lever drag, level wind and centrifugal brakes, this is one reel that is equally at home casting baits uptide from an anchored boat as it is working artificial lures such as jelly worms and shads over deepwater wrecks and reefs on the drift. The Shimano Charter Special is ideal for use with either braid or monofilament lines. Ratio 4.2:1. Line Capacity :- TR2000LD, 400yds of 17lb * TR1000LD, 240yds of 14lb.